Our 2 Orion telescopes are state of the art. A fully automated 10 inch mirror on an German Equatorial Mount and a 12 inch mirror on an Equatorial Platform are available for your viewing. We also have an assortment of eyepieces for the best high magnification and wide angle viewing. We keep our tours limited in size. 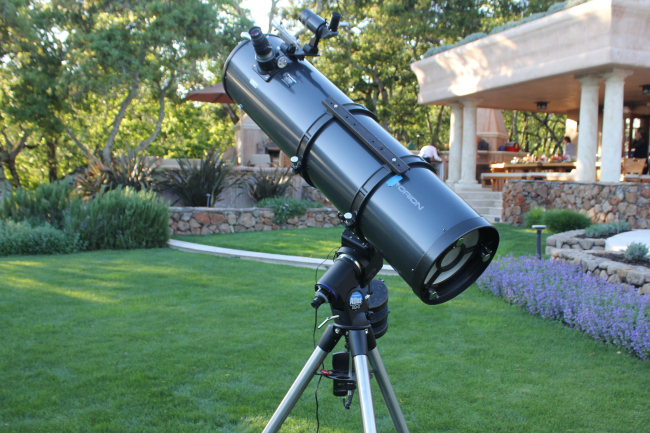 This means you do not have to wait long to step up to the eyepiece and view stars, nebula, planets, galaxies or star clusters. Part of the night sky experience is the comraderie offered by Astronomers. You will be instructed how to focus and adjust the telescopes as we decide which objects to observe.